They have been a treat for as long as I can remember! Yes, I'm talking about big Jaguars. Especially those with good performance! For some decades now, the big Jags have worn the "XJ" tag. The current model, which has evolved over the past few years is as desirable as any from the past and, in fact, the XJ is as big on appeal as it is on its generous size. 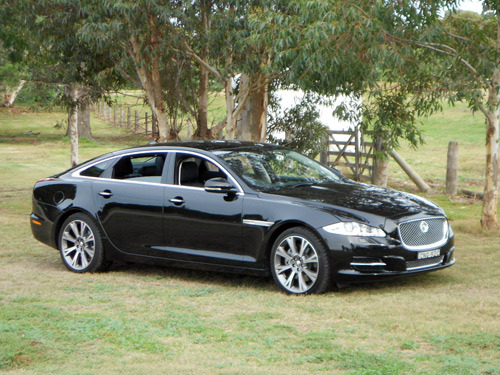 We drove an Ultimate Black coloured Jaguar XJ 3.0 D Premium Luxury Long WheelBase 'saloon' around Melbourne and the Dandenong Mountains area, covering a delightful 528 kilometres. These big cars come with a big price tag. But don't worry about 'sticker shock'. One decent drive of this big Jag will soon dismiss any concern your bank balance may have about your new automotive acquisition. This car is, simply, pure joy! There is nothing more to say about the drive qualities of the Jag, but I feel compelled to add that the acceleration is staggering. The 3-litre V6 diesel puts this big Jag though a 0 to 100 km/h dash in just 6.4 seconds. The wow factor as that happens is remarkable because this is a big, big car. 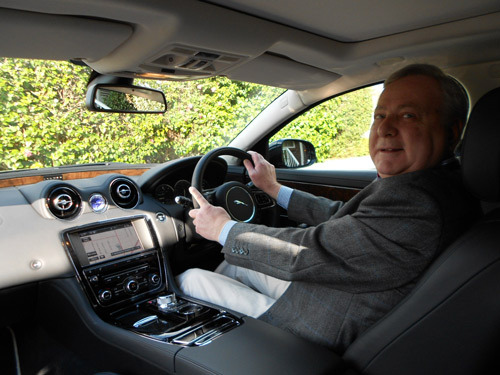 And that performance is undertaken in true comfort and with a level of silence that is a treasured gift in such a classy car as the Jaguar XJ. Despite the enormity of the XJ LWB, it is a remarkable pleasant car to drive. All controls are intuitive and the handling of the car suggests anything but a 1,825kg car. The steering feel is excellent, braking is superb and the ride is thoroughly enjoyable. On the freeway, on twisty mountain roads, on highways and through the urban jungle this car is at ease and cossets the occupants with superior comfort. However, finding an adequate parking space may be a challenge in a 'busy' environment. 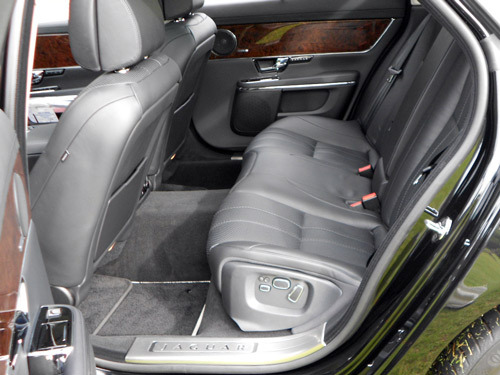 The spacious interior is especially generous for rear seat passengers. 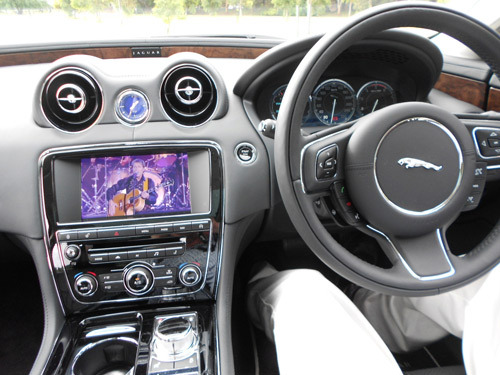 As you would imagine, the Jaguar XJ is quite well equipped and all features are intuitive. Even the optional television is an easy gadget to operate. More than a plaything, the TV/DVD screen has excellent quality imagery. No image shows whilst driving, but the visuals come onto the screen each time the car becomes stationary. 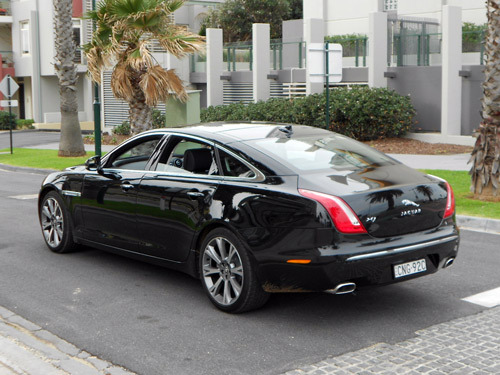 The big rear-wheel drive Jaguar XJ has a 2,993 V6 diesel engine with 202 kW @ 4,000 rpm and 600 Nm @ 2,000 rpm. An eight-speed automatic transmission is standard. It's a good combination that ensures smoothness and more than decent performance. Fuel consumption is rated at an astonishing 6.3 litres per 100 kms, on the combined cycle, for the 3.0 litre diesel engined LWB model. This is a nice figure to achieve. However, our average of 7.8 litres per 100kms, as indicated by the onboard trip computer, was above the rated consumption level. But the way we played with the accelerator at the traffic lights accounts for more fuel use than many drivers would chose. As a matter of interest, the 'urban' fuel consumption rating is a mighty decent result of 7.7 litres per 100kms. Perhaps our fuel consumption figure wasn't unreasonable after all because we had a good mix of driving conditions from light traffic conditions on freeways, to congested urban commuting and onto curvy mountain roads too. So a good variety. 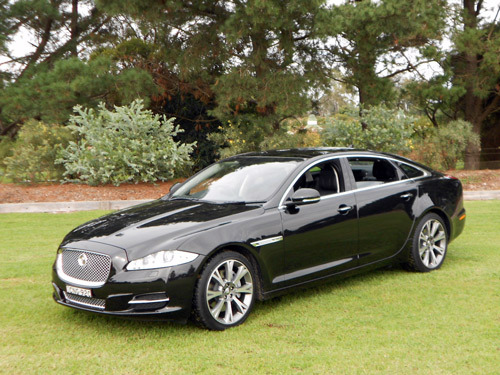 But who is going to complain about a huge car like the Jaguar XJ LWB using 7.8l/100km of diesel? The fuel tank capacity is 82 litres. CO2 emission rating from the 3.0 V6 diesel comes in at a low 167 grammes/kilometre - quite good for such a large car. Six airbags are included. An advanced feature is present, too - sensors detect the size and weight of the driver and front passenger to help minimise injury in the event of a collision and the seatbelts feature “soft landing” technology, which softens the contact with the airbag for the front occupants. The XJ is made from aluminium and magnesium which is exceptionally rigid. Hence, the car is likely to suffer less damage than a conventional steel car during a collision. The Blind Spot Monitor is an extremely valuable piece of equipment which acts as a worthy assistance tool for the driver. 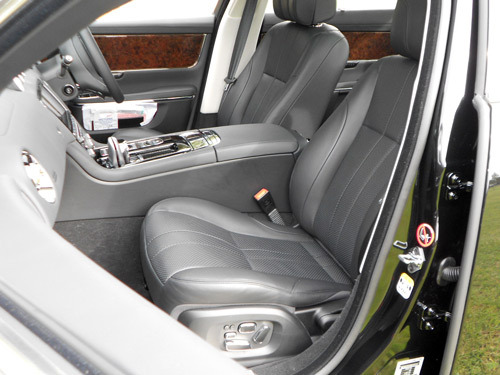 Even the rear seats have electric adjustments. 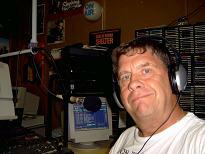 Bluetooth is present, as is satellite navigation and all the quality fitments I expect in an upper level premium car. 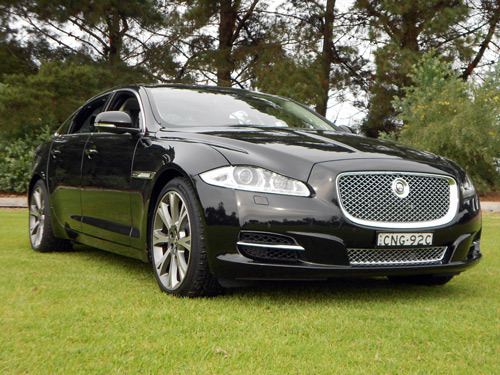 Jaguar offer the thoroughly appealing XJ in short wheelbase and long wheelbase models. Our drive car was the long wheelbase edition. Power choice is between a 3.0-litre V6 petrol, a 3.0 litre V6 diesel (like our test car) and the mighty 5.0 litre supercharged V8 (in two stages of tune), depending on which specification is chosen. Trim levels are available in XJ Premium Luxury (like our test car) which can be equipped with either of the two V6 engines, mid-spec (if there is such a thing when you talk about Jaguars) is the XJ Portfolio which is supplied with either of the two petrol engines and top-of-the-line is the XJ Supersport which comes with the higher tuned V8 supercharged engine. Later in the year a performance orientated XJR will arrive locally to shake any complacency out of those four German brands. 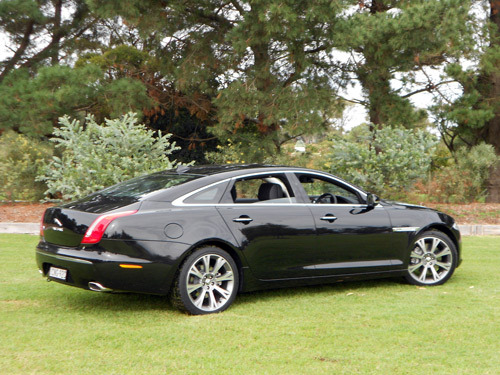 The Jaguar XJ comes with a 3-year/unlimited kilometre warranty. An extension of the warranty, for an extra year or two is available with a maximum of 200,000 kilometres coverage. Conditions apply, of course. Roadside assistance is available for the duration of the new car warranty. Again, conditions apply. Interestingly, the XJ has scheduled servicing for 3 years/100,000 kms included with the purchase. Items subject to wear and tear are excluded. Success in business calls for something special in an automotive acquisition. Be assured, the Jaguar XJ is special! Very special! NOTE: * Manufacturer's List Price (MLP) excludes dealer delivery fees and the numerous statutory charges (commonly known as on-road costs). Additionally, please note that all prices, fees and charges are subject to change without notice, as are the specifications. More Jaguar News ..... here.